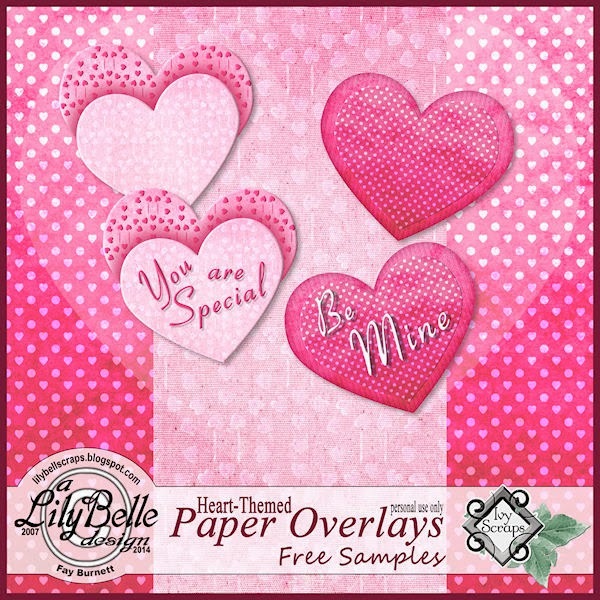 I have a new commercial use product in the Ivy Scraps store of 6 heart-themed paper overlay templates. Each paper template is included in two colours, black and grey. There are 3 formats for each, square, rectangle portrait, and rectangle landscape. The square size is 12 x 12 and the rectangle 8.5 x 11. The files are transparent png, 300 ppi. This product is licensed for CU for PU, commercial use for personal use, and no credit is required. The many ways that these overlays can be used (blended, coloured, as textures, as patterns, to create multi-coloured papers) is only limited by one’s creative imagination. Some uses will, of course, appeal only to designers but simply colouring and layering them over other papers can be easily done by a layout artist. I have used two of these templates to create two papers and 4 heart decorations for you to use on your layouts. Two of the heart-shaped elements are word art and two are blank so that you can add your own words or leave them as is. You will find the download link at the end of this post. Thank you, Fay!! These are beautiful!